To the west of Mâcon, La Route des Vins Mâconnais-Beaujolais passes through a land of beauty with a unique history. Set off on an adventure along this route that is full of poetry, and dotted with exceptional sites such as the Abbey of Cluny or the Roche de Solutré. Along the way, stop in and visit the winemakers who will share some of the region’s great wines with you. From the top of its 493 meters, this imposing rocky spur, which is part of the Network of “Grands Sites de France” looks down over the vines of Pouilly-Fuissé. Since prehistoric times, this exceptional place has served as a refuge and a destination for hunting. Towards the end of the 20th century, the Roche de Solutré carved out a place in history as the President of France François Mitterrand (1981-1995), walked up it every year. It is now home to an archaeological museum which hosts some fascinating collections. From the top of the Roche de Solutré, you can admire the neighboring Roche de Vergisson, a little less famous but just as impressive nonetheless. 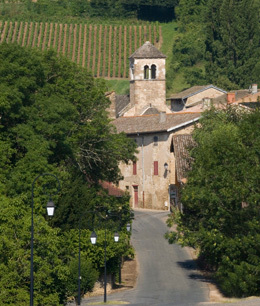 Just 70km north of Lyon, take an enchanting journey along the Route des Vins Mâconnais-Beaujolais. From vineyards to valleys, this trail passes through 78 communes between Saint-Gengoux-le-National and Romanèche-Thorins. 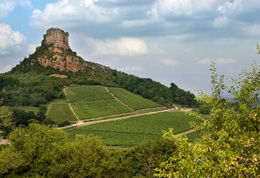 You are in the south of the Bourgogne winegrowing region, where the climate has a slight Mediterranean accent. On the way, take the time to sample the laid-back lifestyle that is cultivated in this beautiful region. You will also appreciate some fabulous views over the Saône Valley. The route here is marked by panels that read “Suivez la Grappe” or “follow the grape” and leads you to estates that produce a wide variety of appellations. In the north of the Mâconnais, the winegrowers will invite you to taste red or white wines that are fresh and lively, from the Mâcon or Viré-Clessé appellations. Farther south, winegrowing tradition has shaped the great white wines of Pouilly-Fuissé, Pouilly-Loché, Pouilly-Vinzelles and Saint-Véran. You are invited to taste these wines as you admire the beautiful landscapes of monumental rocky outcrops. And remember, long before you were moved by this scenery, it inspired the poet Lamartine, one of the region’s famous names. 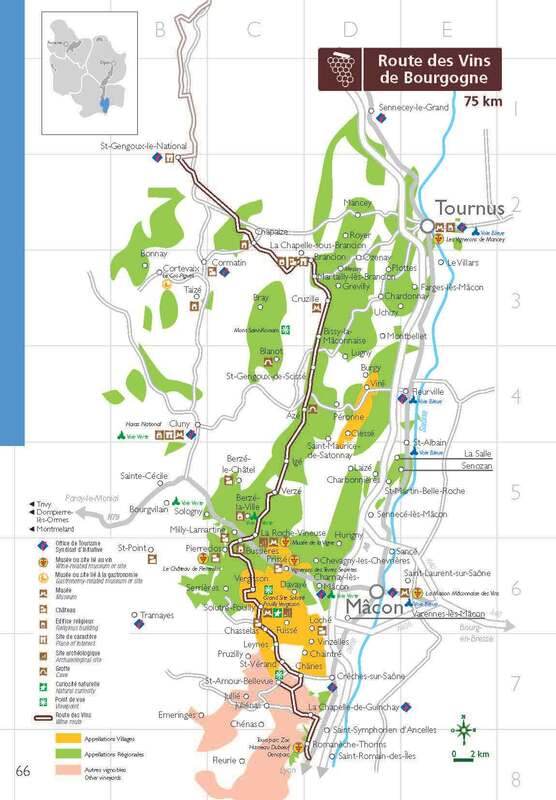 During your stay in the Mâconnais-Beaujolais, you can explore 500km of tourist trails, divided into eight itineraries. These charming little roads will take you back in time, to discover the region’s historic heritage. They will take you through little stone villages, and lead you to Romanesque churches, the sumptuous chateaus of Cormatin and Brancion, or the mysterious prehistoric caves of Azé and Blanot. Before your trip is over, you must visit the Abbey of Cluny, which was the center of Christianity in the Middle Ages. This magnificent site played a part in the creation of the Bourgogne winegrowing region when its monks started cultivating vines over a thousand years ago. To prepare for your trip, contact the Syndicat d’Initiative de la Route des Vins Mâconnais-Beaujolais.